I am currently reading REAMDE, Neal Stephenson’s latest novel, and although I am still going through the initial pages (I am savouring it as I do most of Stephenson’s work), and it already has me thinking about new trends in literature. Cyberpunk is a well-defined post-modern sub-genre within science fiction, with a distinctive narrative style, anti-hero characters and specific technological background. The technology in cyberpunk literature is a mix of cyborg implants and early cyberspace depictions. Interestingly, many of the seminal works pre-date the development of the World Wide Web, but they tend to describe virtual spaces as part of the Internet. William Gibson´s Neuromancer, Neal Stephenson’s Snow Crash, Pat Cadigan’s Synners, and Bruce Sterling’s Islands in the Net are some of the defining works. The genre has had its off-shoots, most notably steampunk, which is beautifully encapsulated in the wonderful yet under-appreciated The Difference Engine by Gibson and Sterling. In the last couple of years I have read some works that do not fall easily into the cyberpunk genre, but have a lot in common with some of its aesthetic values, so I am thinking that we are seeing a new type of cyberpunk, let’s call it Virtualpunk, a type of Cyberpunk 2.0. These works are Halting State by Charles Stross, For The Win by Cory Doctorow, and now REAMDE. The common theme is that all of these works heavily feature virtual worlds, and seem to be informed directly or indirectly on the MMORPG phenomenon best showcased by World of Warcraft. In these three works, vast worldwide games are integral part of the plot, which I believe is the first definition of Virtualpunk. The second is that they are all works with sophisticated understanding of economics and finance, in the case of For The Win, Doctorow actually has written one of the most believable depictions of a financial crash due to crazy derivatives markets that I have yet to read in fiction and non-fiction (including, dare I say, Too Big To Fail). The third characteristic is that all of these works have been written with the real Internet in mind, and therefore this space does not resemble the idealized versions in Snow Crash or Neuromancer. To me this adds a level of realism that some of the earlier cyberpunk lacked. The final characteristic of the new genre, and what prompts me to write these lines in this blog, is that these three works share a high level of legal and regulatory sophistication. In all three novels the protagonists have to deal with cybercrime, filtering, censorship, e-commerce and jurisdictional issues that would not be alien in many Internet regulation classes. In Halting State we are presented with the way in which a police force is asked to deal with a heist of virtual goods worth millions of Euro. In For The Win, we are presented with life behind the Great Firewall of China, institutionalised gold farming, and how game companies try to handle it. In REAMDE we have viruses and cyber-extorsion (so far, please do not spoil the book for me), all dealt with the aplomb and knowledge of someone who is familiar with how virtual spaces operate. Is Neal Stephenson a WoW player I wonder? Anyway, I highly recommend these books, they lead me to think that there is a new literary trend that has wider repecussions than the geek sci-fi circles. Anyone interested in the above works might also want to pick up an augmented reality variant to the trend, works such as Spook Country by William Gibson and Rainbows End by Vernor Vinge. ETA: I am leaving Larry Niven’s augmented reality LARP novels outside. They are rather cyberpunkish in a way. I do believe that is a picture of Shodan at the top of this post. 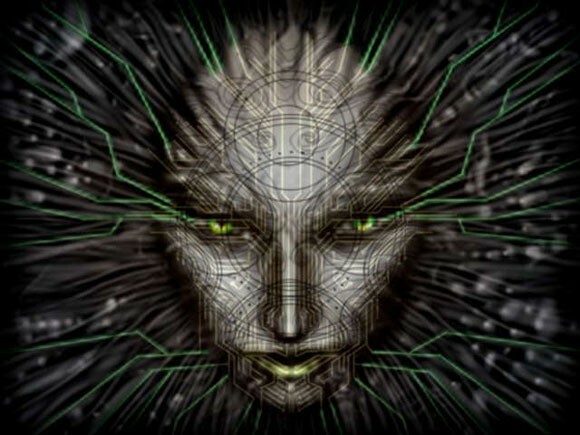 System Shock (the first only, not the second) has yet to be outdone as the best immersive cyberpunk experience in the form of a computer game. It's nice to see her (Shodan's) face is still around.